Sail from Split, dominated by the extraordinary Diocletian's Palace UNESCO heritage site, to some of Croatia's most beautiful towns, such as Hvar & Zadar. Cruise for a few hours each day and visit some secluded bays for a swim. Spend your afternoons exploring the towns and ports we moor in and the evenings trying out some of the many restaurants and bars that specialise in the local cuisine. Cruise on board a floating boutique hotel that provides twin or double cabins, all with en-suite and air-conditioning. Your on board Croatian cruise manager and crew provide a personal experience for every guest ensuring exceptional service is delivered at all times. Enjoy elegant Croatian cuisine as all meals are prepared using local ingredients cooked and served traditionally with a modern flare. National Parks - An optional entrance to Nature/National Parks (approx 100 Kunas) are not included and are to be paid locally. NB. This cruise is reserved for passengers of a minimum of 18 years of age. Dinner on shore on most nights. Lower Deck Cabins are within the hull of the ship accessed by stairs down from the main deck. Above Deck Cabins are on the main deck of the ship and have external or internal access. Split, a town on Croatia’s Dalmatian Coast, is known for its beaches and the fortresslike complex at its center, Diocletian's Palace, erected by the Roman emperor in the 4th century. Once home to thousands, its sprawling remains include more than 200 buildings. Within its white stone walls and under its courtyards and galleries are shops, bars, cafes, cathedrals, hotels and several houses. Check-in is from 10.30am to 12.00pm (midday). Please note your cabin may not be ready until 12:30pm. Your ship will depart the harbour at 1pm sharp. Enjoy a 3-course lunch onboard as we depart Split Harbour at 13:00 and commence sailing towards to our first destination- the seaside town of Trogir. This tiny, medieval town is packed with stunning architecture, impressive fortifications, and cosmopolitan restaurants. Trogir is the perfect place to soak up an authentic Croatian experience, so why not spend your afternoon strolling through the fascinating Old Town, swimming or relaxing in this beautiful area. Enjoy the evening experiencing a local restaurant or waterside cafe. This morning we’ll leave Trogir behind and sail toward the beautiful city of Sibenik, the oldest native Croatian city on the Adriatic. We will stop off at a secluded bay for a swim, where you’ll catch a glimpse of the beautiful island of Zlarin as we make our way to this evening’s destination. We’ll moor in the protected natural harbour of Sibenik, giving you every opportunity to discover the city at your leisure, indulge in coffee and cake on the waterfront riva, or explore the abundance of medieval forts, cathedrals and churches located a stone’s throw away from the ship. Enjoy breakfast overlooking the stunning Adriatic Sea as we cruise toward the fascinating city of Zadar; historically known as the center of Dalmatia. This notable town has stood the test of time and is filled with beautiful Roman architecture and medieval churches, yet blended with cosmopolitan cafes and quality waterfront restaurants. Spend the afternoon along the waterfront of Zadar, taking in the city’s two unique attractions – the sound-and-light spectacle of the Sea Organ and Sun Salutation, which need to be seen and heard to be believed! Sip on champagne as you marvel at Zadar’s most famous attraction; the stunning sunset out over the sea, before indulging in delicious local cuisine. Relax as we set sail and head toward the coastal town of Vodice and enjoy a 3-course lunch at your Captain's favourite secluded bay along the way. Spend the afternoon swimming at one of the beautiful pebbled beaches, relaxing onboard, or take part in an optional activity to the Krka Waterfalls National Park, one of the most beautiful spots in all of Croatia. Early this morning and subject to weather conditions (which are normally excellent), we will make our way across to the island of Vis, one of the most outer-lying islands on the Dalmatian coast. Vis has been used over the centuries as a strategic military port and saw action by the Allied military through WWII against Italy and Germany. It has only recently opened to commercial tourism and the island still retains a lot of charm. If by chance the weather and wind isn't suitable to visit Vis, an alternative stop will be made on the itinerary. The captain reserves the right to amend the itinerary, as his number one priority is always safety. Enjoy breakfast onboard overlooking the stunning Adriatic as we cruise towards Hvar island. Relax in the Croatian sunshine or take a dip in the refreshing Adriatic at our mid-morning swim stop before lunch is served onboard. After lunch, we continue on to Hvar, the ‘French Riviera’ of the Adriatic. Feel the part sipping champagne and docking alongside other super yachts in Hvar Town. Although renowned for it's celebrity spotting, Hvar still remains authentic to its roots, with its cobbled streets, historic architecture and 7th century fort ruins overlooking the town. Don’t miss out on the included Hvar Orientation Walk to see the Renaissance Cathedral with its original tower, as well as the oldest community theatre in Europe, which dates back to 1612. The docking time in Hvar can be early evening in peak season due to port authority restrictions. However, if guests would like to arrive earlier, water taxi transfers will be arranged. Embrace your last morning cruising the Dalmatian coast as we make our way back to Split. Enjoy your final swim stop in a secluded bay just outside of Split, before taking in this spectacular city as we cruise into Split harbour in the afternoon, The UNESCO World Heritage city of Split bases the city centre in and around the stunning Diocletian's Palace, a Roman emperor's' retirement palace from 295-305 AD. This beautiful palace consists of 220 buildings within its boundaries, is home to 3,000 people and Split is now the second largest city in Croatia. Stroll through the palace basement filled with market stalls and historical architecture or have a coffee on the waterfront Riva. Our Elegance ships are named Olimp, Romantic Star, Queen Jelena & Esperanza. The ship style is intentionally different from all of the others and is set to have the baroque and oriental appeal of a steamboat, with beautiful wide sails adding to its antique look. Whilst the design and features may take on a traditional feel, the facilities onboard are nothing short of advanced. The 50 meter ship boasts 19 spacious cabins, providing a comfortable cruising experience for a maximum of 38 guests. Every cabin is equipped with air-conditioning, twin or double beds, traditional round windows and a separate ensuite. The deck, handrails, exterior doors, window frames and saloon floor are completed with high quality wood to emphasize the desired classic look. On the other hand, the innovative facilities of the ship include a modern jacuzzi on the top deck and spacious lounging areas. Offering both above and lower deck twin and double cabins, all with excellent air-conditioning options, Olimp is set to guarantee an amazing sailing adventure to all 36 of its lucky passengers. They can relax on the main deck, in the saloon, or take in the sunshine and the spectacular Adriatic scenery from the top-deck splash pool, with a cocktail in their hands made by a skillful bartender at one of the onboard bars. This vessel is perfectly designed for luxury small ship cruising. 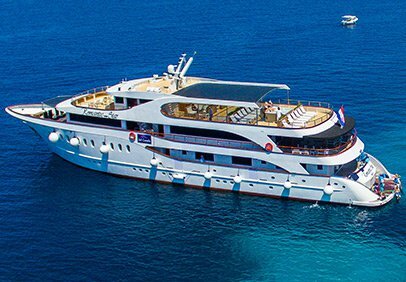 Holding a total of 36 passengers, this ship is fitted with both above and lower deck twin and double cabins all containing private ensuites, air conditioning and donning the latest amenities. Enjoy relaxing on the main deck in the shade, or take in the sunshine on the top deck as you sail the Adriatic dipping in and out of the splash pool. Esperanza has been perfectly designed for luxury small ship cruising, yet her sleek lines provide speed, stability and comfort. 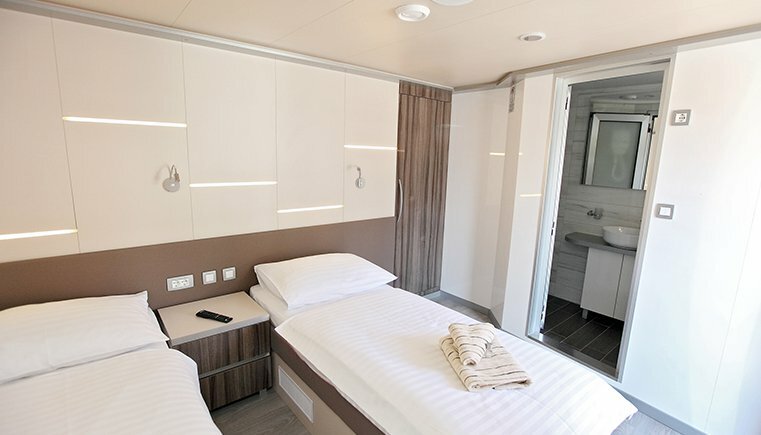 Holding a total of 38 passengers, Esperanza is fitted with both above and lower deck twin and double cabins all containing elegantly decorated private ensuites, air conditioning and not to mention all the latest facilities. See feature image. Deck plan shows the Diamond. • Relax and enjoy sailing the crystal waters of the Adriatic and explore the less visited central Croatian coast and islands. 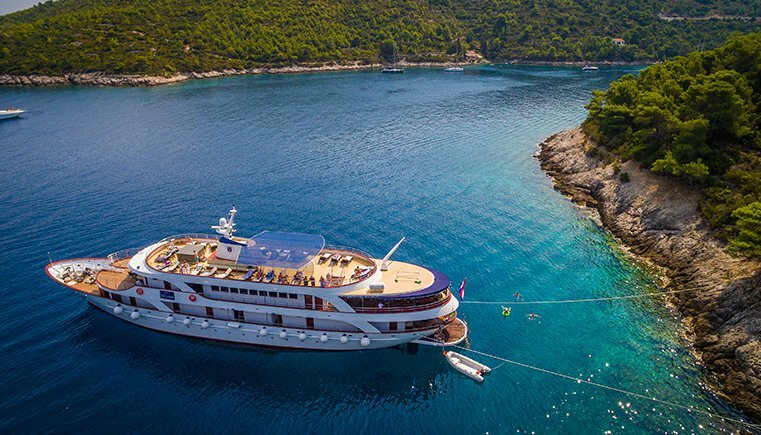 Enjoy the highlights of southern Croatia on a brand new luxury vessel. Discover the Adriatic coast and immerse yourself in the natural, cultural and historical sights of this breathtaking country. ......click here to read more.